Reading and share top 10 famous quotes and sayings about Bagpipes by famous authors and people. 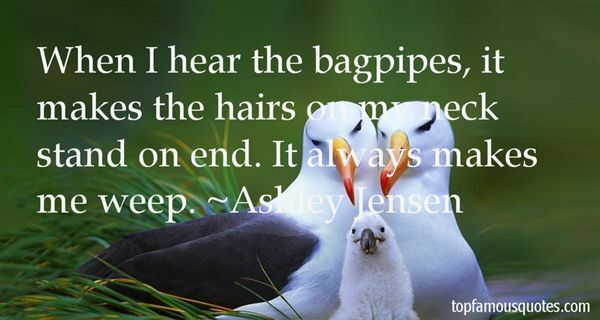 Browse top 10 famous quotes and sayings about Bagpipes by most favorite authors. 1. "These are bagpipes. I understand the inventor of the bagpipes was inspired when he saw a man carrying an indignant, asthmatic pig under his arm. Unfortunately, the man-made sound never equalled the purity of the sound achieved by the pig." 2. "When I hear the bagpipes, it makes the hairs on my neck stand on end. It always makes me weep." 3. "New Rule: Stop calling bagpipes a musical instrument. They're actually a Scottish Breathalyzer test. You blow into one end, and if the sound that comes out the other end doesn't make you want to kill yourself--you're not drunk enough." 5. "Any sign of them yet? he asked. Will looked at him. 'Yes', he said. 'A party of fifty Scotti came though just twenty minutes ago'.Really? Horace looked startled. He wasn't fully awake yet. Will rolled his eyes to heaven. 'Oh, my word, yes', he said. 'They were riding on oxen and playing bagpipes and drums. Of course not,' he went on. 'If they had come past, I would have woken you-if only to stop your snoring'. I don't snore', Horace said, with dignity. Will raised his eyebrows. 'Is that so?' he said. 'Then in that case, you'd better chase out that colony of walruses who are in the tent with you...of course you snore." 6. "It was long past time to change the subject. 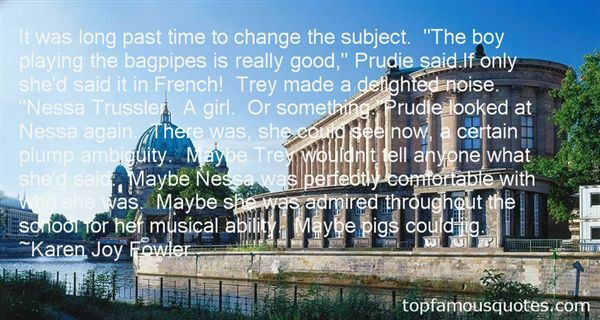 "The boy playing the bagpipes is really good," Prudie said.If only she'd said it in French! Trey made a delighted noise. "Nessa Trussler. A girl. Or something. "Prudie looked at Nessa again. There was, she could see now, a certain plump ambiguity. Maybe Trey wouldn't tell anyone what she'd said. Maybe Nessa was perfectly comfortable with who she was. Maybe she was admired throughout the school for her musical ability. Maybe pigs could jig." 7. "HOrrible. The most horrible sound on earth. The sound of death and torture and the agonies of a burning hell," Lisle said. "Damn them. It's bagpipes." 8. "Constable Moore had reached the age when men can subject their bodies to the worst irritations - whiskey, cigars, woolen clothes, bagpipes - without feeling a thing or, at least, without letting on." 9. "The Irish gave the bagpipes to the Scotts as a joke, but the Scotts haven't seen the joke yet." 10. "Liam was too Scottish-''Oh but so Scottish, Bel! Come on, the bagpipes? The interminable quotations from Braveheart? Anyone who's proud of coming from Scotland obviously has issues-"
Colombian humor is very black, very sarcastic."